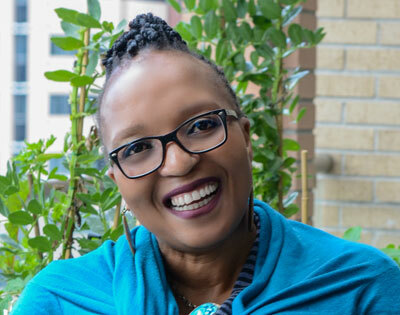 I first “noticed” Bulelwa Makalima-Ngewana a few years ago when she was deputy CEO of the Cape Town Partnership because of her Twitter handle - @Darksjokolade – and the insight and humour she shared. This was around the time she was driving Cape Town’s successful bid to become World Design Capital 2014, which earned her a lot of respect. Then I started receiving her newsletters when she took over from Andrew Boraine and became CEO in 2012. Based on the content, I just knew that this was someone I had to meet; someone I wanted to interview. So when a strategic planning session was scheduled for the Cape Winelands Biosphere Reserve, I just knew I had to take Mark Heistein, the Biosphere’s CEO, along to meet her too for some inspiration. We were both inspired by Bulelwa! And the first lesson about her is how accessible she is – the appointment to meet was made at a day’s notice! The Cape Town Partnership was formed in 1999 by city property owners and businesses because of increasingly poor service delivery in the CBD – the municipality was imploding under its then ANC leadership. CTP’s first project was the establishment of the Central City Improvement District. Within 10 years the CBD was the cleanest and safest in SA, and business was booming. On the back of that experience, the CTP started driving Cape Town’s successful World Design Capital bid, with Bulelwa at the helm. Design beyond borders – The Fringe brand was born to market the east city where there is a high concentration of design-related businesses. The focus has shifted from place marketing and branding to the deepening of relationships with all people who have a stake in the future of the area. Plotting a new way forward – Trafalgar Park in Woodstock/District 6 has emphasised the need for a shift in the approach to initiating and defining projects. "We need to be invited in, which means we have to build trust and this takes time." Mapping moments – Social development and research in the eastern city, primarily among street groups, to provide case-study data to demonstrate interventions. What is design storming? – using design to promote collaboration, raise awareness and develop open-source ideas that can serve as a catalyst for change. En route with informal traders – CTP has partnered with the informal trade community to seek new design solutions for the informal trade units. It considers trading locations, unit and goods storage, vendor movement, economic sustainability and relationships with the formal sector. Streets as community spaces – Open Streets is an initiative to close roads to motorised traffic on a regular basis to be transformed into spaces for public recreation. The Company’s Garden gets connected – Unlocking the city for more people means making the most of public spaces. Free WiFi adds an extra reason to visit this space. Creating a 24-hour city – Research into the barriers for extended city hours and finding ways to overcome them. City Sounds at City Hall – putting a historic civic building back on the map as a cultural asset by breathing life and sound into it through music. Opening up the city through creativity – Creative Week Cape Town is an annual festival which is an open call to all Capetonians to host creative events. Supporting creative talent – Creative Nestings is Partnership programme which helps young people make their ideas happen. Izimvo zase kasi – A Xhosa phrase for “views from the city,” is an open space where those committed to making the city a better place can come together at various sessions to connect and create positive change. Our city, our stories – A bimonthly publication, Molo is an experiment in citizen storytelling aimed at fostering connections between people and sense of belonging to the places where live and work. Growing urban change – green clusters: conversations to align individual efforts and lending more momentum to the urban agriculture movement in Cape Town. Towards a resilient city – guides and tools to inform policymaking and action that encourages stakeholders to work together to reduce overall carbon emissions. Why social housing matters – conversations around the provision of appropriate, affordable housing in structures close to Cape Town’s city centre. Bulelwa arrived at the Cape Town Partnership and Cape Town ten years ago and, listening to her, one realises that she’s absorbed more of the city’s DNA than most that have spent a lifetime there. I had expected someone special but hadn’t anticipated how special – she’s articulate, insightful, analytical, exuberant and positive… and her straightforward honesty is a delight. We spent less than an hour together, but she jumped into my list of top 5 people I met in 2014. Cape Town doesn’t know how lucky they are to have this immigrant from the Eastern Cape! Prior to working at CTP she was the Senior Manager for Africa Programs at the Centre for Conflict Resolution, where she was instrumental at establishing and implementing conflict resolution and mediation programs in various African countries. Few people can demonstrate the importance of design and creativity in making something special, as well as she can. She walks the talk… and her obvious competency shines through. Yes, I am Bulelwa Makalima-Ngewana’s latest fan. For Mark’s benefit, exploring the relevancy of the Partnership to the Biosphere Reserve, she ran through how her organisation is structured. Its budget is between R10 million and R18 million a year, a variance which makes long-term planning difficult. Their income is grant funding mainly from the City, some from Province and a percentage of CBD parking income. They are managing agents for City Improvement Districts (CIDs) which have grown from just one in 1999 to 26 around Cape Town today. These are funded by top-up levies from ratepayers. Their big challenge is to triple central Cape Town’s residential population and there is a lack of affordable (not RDP!) housing, and uses the Brickfields development in Johannesburg as an example of what is needed. Another is that the city has no retail strategy (– which is the downfall of municipalities throughout SA, and shows how little they know about really managing their towns and cities). In Cape Town’s case, she says “this is being solved organically,” and the Partnership does have some control over the spaces between buildings. A new urban attraction in the CBD, The City Walk, which unfolds in 2015 will bring the city’s Big Six tourism attractions (Cape Point, Robben Island, Groot Constantia, Table Mountain, Kirstenbosch and the V&A Waterfront) up to seven. Prioritising the very DNA of Cape Town – its people and street life – The City Walk will see the cultural, economic and social upliftment of the city’s interconnected public space. This pedestrian spine of the city starts in the Company’s Garden, proceeds down Government Avenue and St George’s Mall, before turning onto the Fan Walk and ending at the Prestwich Memorial in St Andrew’s Square. The precinct will feature free WiFi and the evolution of informative signage to assist in peeling back the layers of Cape Town’s hidden stories. The introduction of more public ablutions, experimental street food offerings, permanent as well as temporary public art, and event activations will form a practical aspect to developing the space as a lively destination. Recognised for its safety, liveability and tourism desirability, the Cape Town CBD is steeped in heritage, public art, retail and events – both informal and formal. The City Walk will thread these elements together across all the layers of the Cape Town CBD story into an informative, engaging precinct to captivate both locals and visitors. The Company’s Garden is also set to become very special – as it rightfully should be. Madame Zingara’s move to the restaurant sees it redesigned as something Capetonian- and family-friendly. The history of the Garden will be told as a narrative aimed at children – the rose garden, the vegetable garden and the secret garden; it will be a safe place for kids. QR codes are planned for every tree. She makes the point that the Partnership enables the City to test policies before they are finalised as bylaws. 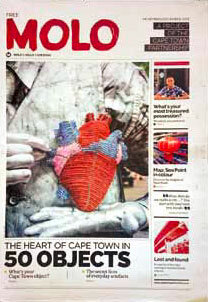 And it’s that focus on people and continuous re-evaluation that will make Cape Town even more captivating. 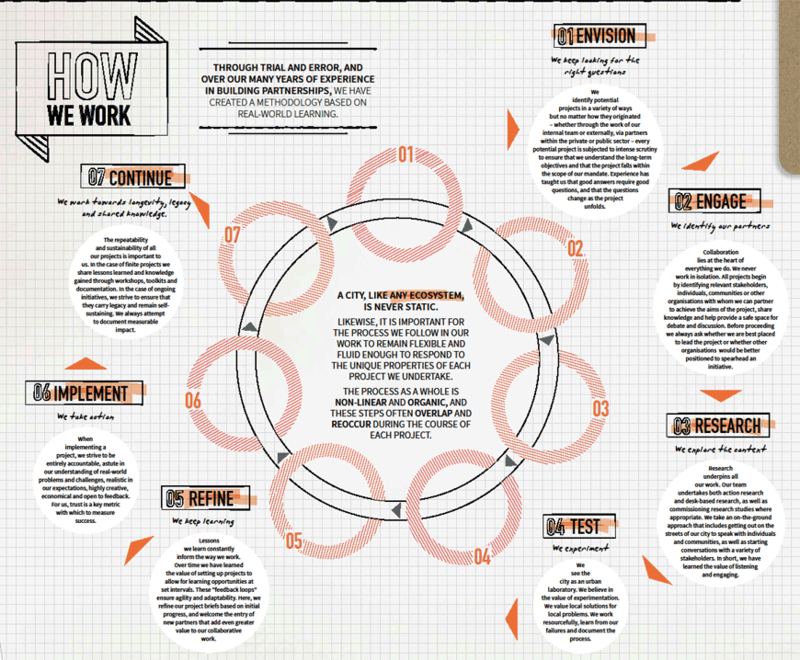 Download the 2014 annual report for a larger version of this diagram.